It seems strange to ask should Christians celebrate Christmas, since it’s named for Christ. But was He born December 25? Does He want us to celebrate it? There are five major reasons why Christians should not celebrate Christmas. To discover what they are, watch this short video by Foundation Institute instructor Dave Myers. Christmas seems the most Christian of holidays, even taking its name from Christ. So why wouldn’t Christians celebrate Christmas? 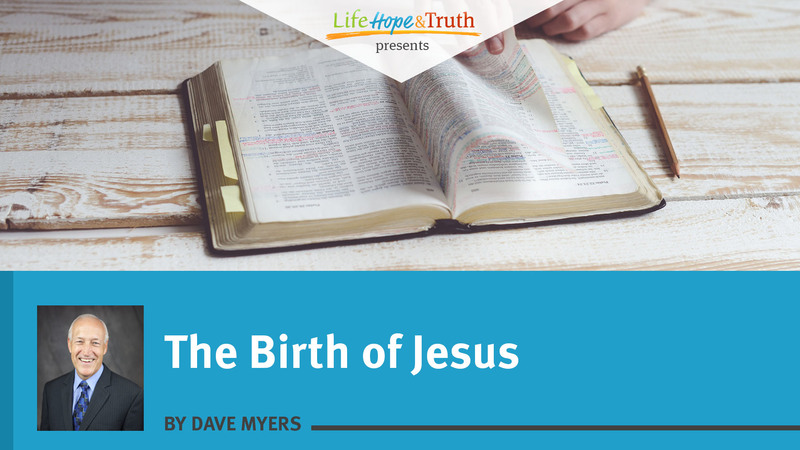 Could it be that Christ was not born on Dec. 25? Could it also be that every year many articles are written in newspapers about the pagan origins of this holiday? Even religious people who celebrate Christmas have written about this topic. Consider this history from the Grace to You website: “The decision to celebrate Christmas on December 25 was made sometime during the fourth century by church bishops in Rome. They had a specific reason for doing so. “Having turned long ago from worshiping the one true God and creator of all things, many early cultures in the Roman empire had fallen into sun worship. Recognizing their dependence on the sun’s yearly course in the heavens, they held feasts around the winter solstice in December when the days are shortest. As part of their festivals, they built bonfires to give the sun god strength and bring him back to life again. When it became apparent that the days were growing longer, there would be great rejoicing. Many people today want to put Jesus back into Christmas, but the fact of the matter is that He was never in Christmas in the first place. Dec. 25 was a polytheistic festival based on myth. Is adopting pagan customs acceptable to God? The Bible reveals that God does not want humans to worship Him in the same manner as the pagans worshipped their gods. Therefore, based on what the Scriptures disclose, we believe God and His Son are not pleased with Christians celebrating Christmas. God explicitly warned ancient Israel against incorporating pagan customs into their worship of the true God. “When the LORD your God cuts off from before you the nations which you go to dispossess, and you displace them and dwell in their land, take heed to yourself that you are not ensnared to follow them, after they are destroyed from before you, and that you do not inquire after their gods, saying, ‘How did these nations serve their gods? I also will do likewise.’ You shall not worship the LORD your God in that way; for every abomination to the LORD which He hates they have done to their gods; for they burn even their sons and daughters in the fire to their gods. Whatever I command you, be careful to observe it; you shall not add to it nor take away from it” (Deuteronomy 12:29-32). What’s wrong with the traditional nativity scene? Christians should also understand that the Bible itself reveals that many of the traditional nativity scenes are not biblically accurate either. One commentary states that, “as these shepherds had not yet brought home their flocks, it is a presumptive argument that October had not yet commenced, and that, consequently, our Lord was not born on the 25th of December, when no flocks were out in the fields. On this very ground the nativity in December should be given up” (Adam Clarke’s Commentary, note on Luke 2:8). Another study source agrees: “These humble pastoral folk are out in the field at night with their flock—a feature of the story which would argue against the birth (of Christ) occurring on Dec. 25 since the weather would not have permitted it” (The Interpreter’s One-Volume Commentary, 1971, note on Luke 2:4-7). The Bible does not list how many wise men were there, and they came into the house (not manger) where they saw the young Child. So, the traditional story of three wise men coming to the manger is just not found in the Bible. We have to realize that just proclaiming something to be Christian does not make it so, no matter what our traditions have been or what rationalizations we may employ! For instance, over the decades, parents have told their children about Santa Claus. The problem is—he does not really exist, nor does he have a workshop at the North Pole. Where in the Bible does God excuse us for lying—especially to our children? Some also believe that there should be no problem with gift giving at this time of year. However, in his book 4,000 Years of Christmas: A Gift From the Ages (1997), Episcopal priest Earl Count ardently relates historical connections between the exchanging of gifts on the 12 days of Christmas and customs originating in ancient, pagan Babylon. He also shows that mistletoe was adopted from Druid mystery rituals and that Dec. 25 has more to do with the ancient Roman Saturnalia celebration than with Jesus. How do I tell my relatives? So, should Christians celebrate Christmas? After examining the subject, many come to the conclusion that they should not. Many then ask, “Okay, then how do I tell my relatives and family that I will no longer be celebrating Christmas?” We recommend explaining in a kind way that you cannot in good conscience continue to observe a holiday not authorized in the Bible. If they ask about giving gifts, you can respond that there are plenty of other opportunities throughout the year for honoring loved ones with gifts. Some relatives will accept that decision and some may not understand; so it is better not to try to change their beliefs lest they get upset. Many who recognize the nonbiblical origin of Christmas try to avoid getting into a discussion about the issue unless someone asks why. We try to follow the principle in 1 Peter 3:15: “But sanctify the Lord God in your hearts, and always be ready to give a defense to everyone who asks you a reason for the hope that is in you, with meekness and fear.” If someone wants to know more, it is certainly fine to explain the pagan origins of this holiday and God’s command for us not to worship Him in a similar manner. The members of the Church of God, a Worldwide Association (which sponsors this website), do not get involved in Christmas observances. Instead, we are told to honor Jesus Christ on the anniversary of His death (not His birth). See 1 Corinthians 11:23-29. Jesus Christ reminded His disciples (as they ate the bread during the New Testament Passover) to “do this in remembrance of Me” (Luke 22:19). Jesus was born as our Savior, but He is also coming again as the great King of Kings and Lord of Lords (Revelation 19:15-16). The millennial reign of Christ will then begin on the earth. This prophesied event is pictured by and emphasized during the annual Feast of Tabernacles, which occurs during each autumn in the northern hemisphere (Leviticus 23:33-35). Christ told His disciples to keep this feast, as He observed it as well (John 7:2, 14, 37-39). So, instead of celebrating the Christmas holiday, a Christian should be celebrating the annual commanded festivals of God. You can learn more about these festivals in this section on how God’s holy days reveal His plan of salvation.